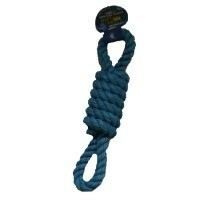 Nuts for Knots Coil Figure of 8 Tugger is a delightful rope toy that your pet is sure to love. Your dogs will be kept entertained and active for hours as this toy can be used in a variety of fun games like fetching and throwing and is ideal for games of tug of war. Regular exercise is extremely beneficial to your dog's mental and physical health. The Nuts for Knots Coil Figure 8 Tugger is made from durable and tough material so that it lasts for a long time and can be used again and again. Also, through chewing the toy, the health of your dog's teeth and gums will vastly improve! Circumference of central tube is approximately 27cm (10.6").